Albertans looking for faster travel in the province may be closer to having their prayers answered. Magline Transit, a magnetic levitation technology, could take commuters from Edmonton to Calgary in under 45 minutes while only using solar power. Travelling at speeds up to 500 kilometres-per-hour, it could also make stops at Red Deer, Calgary International Airport, or be used by companies to transport bitumen or goods. Pioneered by Edmonton based Magnovate Technologies, the technology finally carries through on the promise of a high speed maglive transportation system, says CEO Dan Corns. The technology has been called a cheaper and faster alternative to "corrupt high speed rail," an "out-of-this-world transportation plan," and been featured in the Silicon Valley Journal. Consumers would pay $60-$75 to travel between the two cities, with costs expected to go down once ridership increases. 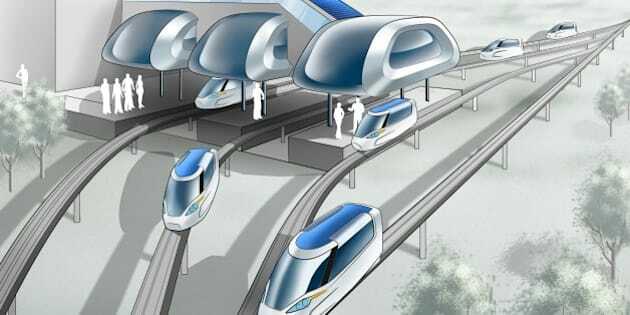 Pitched as a public-private partnership, the company proposes to have the $3.4 billion system built in 4-5 years. "The system could be completely energy independent," Corns told The Huffington Post Alberta, and might even generate more energy than it would consume. It would be built on an elevation of 15 to 20 feet, allowing for roads and fields to co-exist under it. "We could have the system service bedroom communities that are along the Edmonton to Calgary corridor," says Corns. The company has had initial talks with government officials and say there is a lot of "positivity" concerning the project. The technology has been used in China, Japan and Germany and boasts a perfect safety track record, according to Corns. It would transport "people, goods and bitumen and really any other natural resource that might pass through Alberta," he says. The proposal comes at the same time when Elon Musk, co-founder of the electric car Tesla, announced he's working on a high-speed rail called Hyperloop. Silicon Valley's technology reporter Preeti Upadhyaya says Magline Transit proposes a more realistic timeline and could be a lot cheaper than Hyperloop. Magnovate Technologies, which also has an office in San Jose, say their system is cheaper than current ones being used in China and other countries. It also has a passive switching technology, allowing for trains to change tracks and stop without interrupting the main line.